Find your Personal Power – Australian author, Nola Anne Hennessy, has known her share of sadness, tragedies, and disappointments. She found the courage to move through the difficult times and advocates readers to forgive ourselves, discover our individual gifts, and refuse to be put into a box of expectations. The biggest barrier to personal achievement is negativity. In No Boxing Allowed, this NABE Pinnacle Award winning author, shows us the power of positive being and acting. Karma exists and universal justice prevails. Whatever we do in life, both good and bad, either comes back to exalt or haunt us. It is imperative to re-engineer our thoughts, words, and actions to a positive light so that we re-program our lives for a constructive outcome. A chapter on leadership focuses on the issue of whether leaders are born or made. Charisma, kindness, generosity, positivity, honesty and forgiveness are some of the virtues and traits of a great leader. Nola rightly contends that “the more great leaders we have in this world, the better the world will become.” We can all be great leaders in our fields when we determine to be so. Nola offers inspirational wisdom that each of us can take to the bank. Every human is unique, different, and a gift. Once we realize our full potential, our destiny becomes a personal choice without dictatorship from someone else. It’s imperative to make a positive difference in the lives of others at home, work, and in the community. Towards the end of the book, she includes key elements to a successful business relationship including respect, trust, understanding, tolerance, team play, patience, honesty, integrity, flexibility, commitment, responsiveness, and more. I would say that these values are not just the underpinning for work relationships, but the most important ingredients to a happy life filled with love, family, friends, and colleagues. 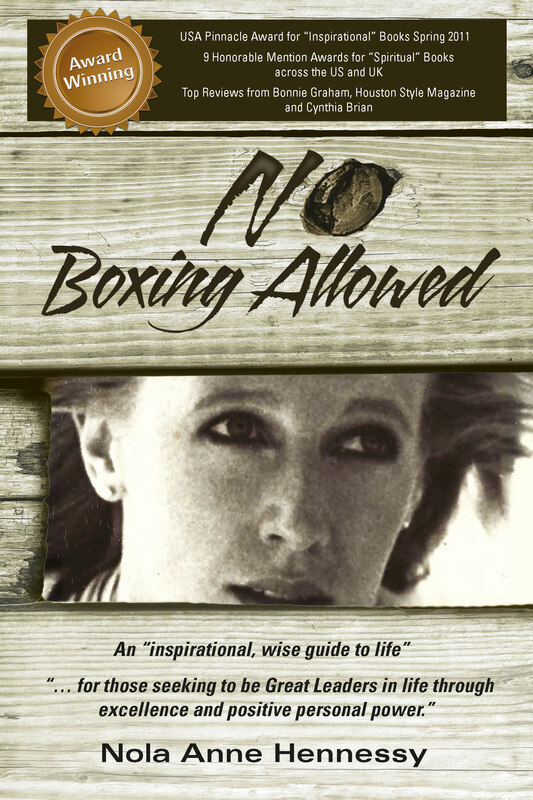 The wisdom enclosed in No Boxing Allowed continues in her follow-up book, from PMS to PMA. Buy both books for a complete prescription for living authentically and fully. And remember, there are no failures, only opportunities from which to grow, expand and learn. No Boxing Allowed!